You will find the Purchases settings on your WordPress admin area navigating to the GamiPress menu -> Settings -> Add-ons tab. Page to show a complete purchase history for the current user, including each purchase details. The [gamipress_purchase_history] shortcode should be on this page. Note: On install this add-on, automatically will create a page with the title “Purchase History” with the [gamipress_purchase_history] shortcode as content. The currency to display on all purchases. 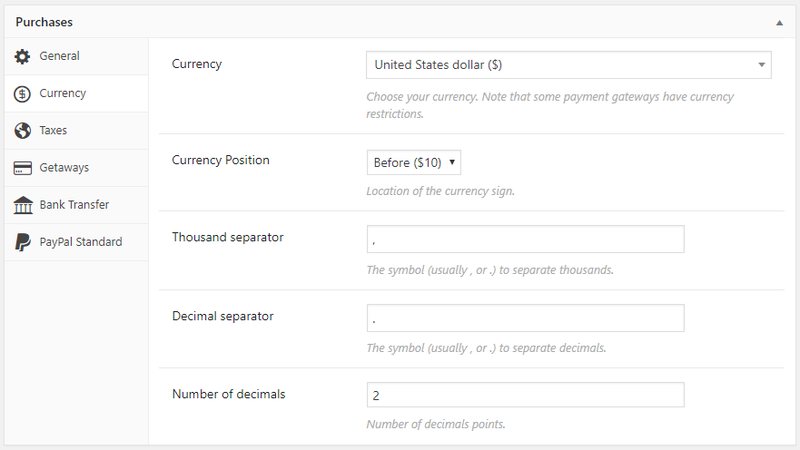 Note that some payment gateways have currency restrictions. Location of the currency sign. Available options are before price or after price. The symbol (usually , or .) to separate decimals. Checking this option taxes will be applied on purchases. 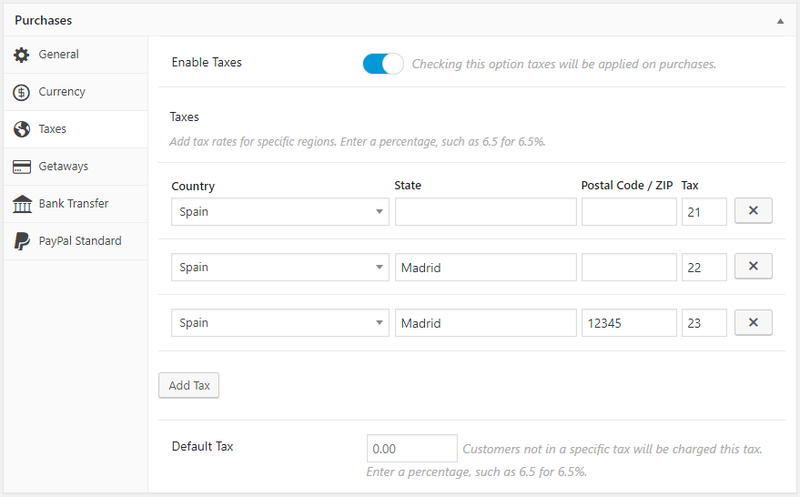 Add tax rates for specific regions. Enter a percentage, such as 6.5 for 6.5%. Note: Always will be applied the most precise tax to the given country, state and postal code / zip. To apply a tax to the whole country, just leave blank the state and postal code / zip. Same effect will happen with state taxes, add a country and state and leave blank the postal code / zip to apply this tax to the whole state. Customers not in a specific tax will be charged this tax. Enter a percentage, such as 6.5 for 6.5%. On enable any getaway, you will see that new tabs are added the Purchases settings box to let you configure each enabled getaway. Purchases give you the ability to send the purchase receipt to your customer and also send an email notifying it to site administrators. Take a look to this page to configure them.